Mom made her peppers with boiled egg very different stuffing than most... we just loved them! 1 28 oz can whole tomatoes put through food processor with little chunks left or make a homemade meat sauce with ground hamburger into the sauce. Slice the top of each pepper off with a sharp knife, remove the stem leaving a circle in the top of the pepper, then slice the bottoms so they are flat when standing up ( about a 1/4 of an inch). Scrape the inside using a melon ball scooper or spoon to make smooth. Save scraps of peppers. Mix the raw meat with chopped eggs, rice, herbs, bread crumbs, and small can of sauce together. In a medium size bowl, mix the large can of tomatoes and wine together pour around the bottom of the pan. Sprinkle with grating cheese and add any scraps of peppers and whole garlic to the sauce around the pan in the sauce. Bake at 400 for 45 minutes to an hour, if the bottom looks evaporated, add some water to the sauce.. Keep basting the tops with the sauce. Add more cheese if desired to the top when serving. I love your mom's recipes, Claudia! These stuffed peppers look amazing. Happy Monday! I love stuffed peppers. Going to have to have try this one. They look so good in the picture. Oh my these sound delicious and I'm picking all of my big peppers today. My mother always made stuffed peppers too, but nothing like this. I don't remember eggs in there. That sounds very tasty. And it seems it's not too complicatad to make. 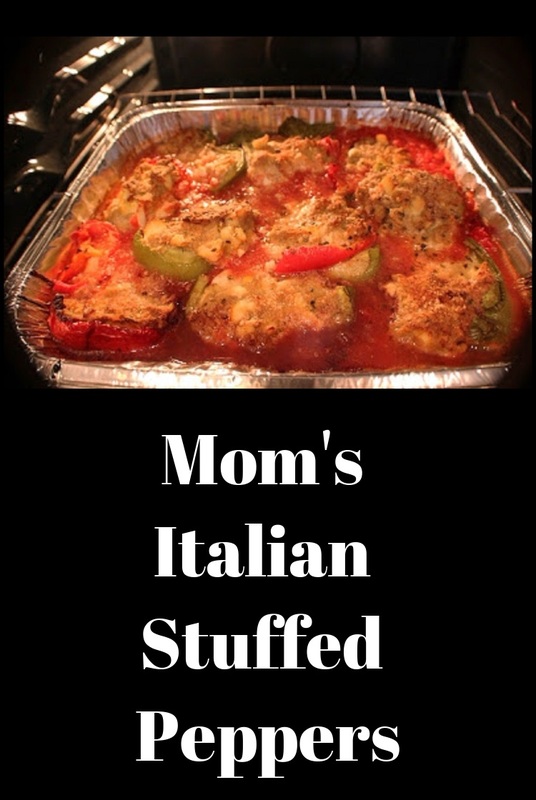 I am drooling over here, staring at the amazing stuffed pepper photos, especially the second photo with the crusty cheese on the top. I can just smell the aroma sooooooooo good! Now I'm starving after seeing this, Claudia! I love stuffed peppers but have never seen it with eggs and hve to try it. Your mom has the best recipes! What a grand, warming, welcoming recipe. Your mother's additions and changes to what is American tradition really adds nuance and flavor. It's wonderful that you have so many to share with us. I just embrace recipes where Italians took from their home country and adapted it to their new. Now these are stuffed peppers I would totally inhale! These look fabulous! I'm finally getting through days of emails since I've been too busy the past few days to do any blogging. Here I've already come across 2 new posts you've done. You are a busy lady. I love stuffed peppers as does the rest of my family. It's always nice to have a new version to share with my family. Passed down recipes are the greatest! Whenever I make stuffed peppers I use the crockpot, I will have to try this way sometime. It looks great! I think I just picked the last of our peppers (freeze/frost tonight). Glad I did so I can make these! Your mom's recipe sounds great. Sounds like a great recipe! I like hard boiled egg in just about everything! I am loving that difference-so saucy and full of great ingredients! Now I know where some of your food talent comes from. Have a great day! I wanna come to dinner and for sure it would be worth the drive... Not a better stuffed pepper recipe out there Claudia!! I like your mom's version, the eggs are a nice edition. I haven't seen chopped eggs in stuffed peppers before. I love it! I love the flavor it's very yummy but after an hour and a half my rice is still hard. I suggest partially cooking the rice before stuffing the peppers.